Prebiotic for Advanced Gut Health - Immune System Booster & Dietary Fiber - is currently on backorder. You may still purchase now though and we'll ship as soon as more become available. BioSchwartz Advanced Prebiotic contains the prebiotic fibers PreticX Xylooligosaccharide and PreforPro. PreticX is an FDA GRAS certified ingredient that provides valuable bacteria that other prebiotics lack. 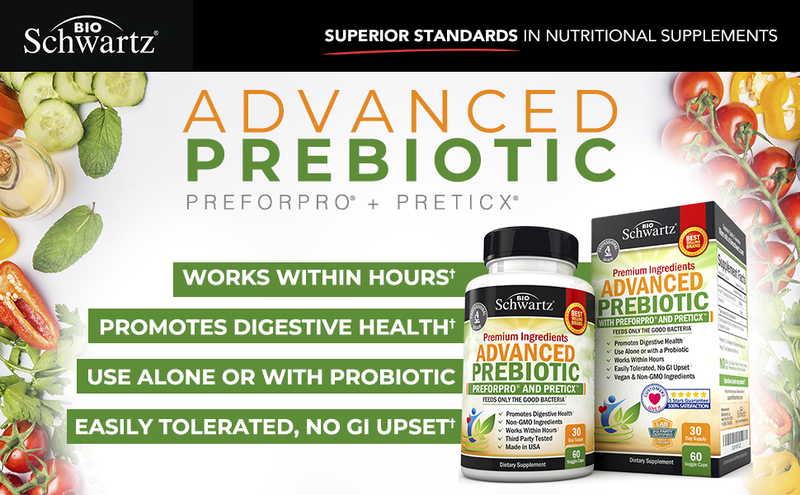 PreforPro prebiotic influences the microbial population of the gut without requiring a large dose to be effective. It functions in both the small and large intestines, accelerating the growth of many probiotic species and positively boosting immune response, all without causing gas. These fibers together promote healthy intestinal flora, improve digestion, strengthen the immune system, and inhibit the growth of dangerous microbes. BioSchwartz Advanced Prebiotic is specially formulated to work in conjunction with BioSchwartz Probiotic 40 Billion CFU. Probiotic are fragile; they can be killed by heat, stomach acid, or die over time, but BioSchwartz probiotic features the most innovative delivery system to ensure strains can survive stomach acid and reach your large intestine, making it 20 times more effective than other probiotic. When these two work together, these supplements maximize gut health more efficiently and are more effective than other digestive enzymes and inulin powder at reducing bloating, diarrhea and other gastrointestinal issues that can inhibit your daily life. BioSchwartz Advanced Prebiotic are free of dairy, soy, gluten, wheat, tree nuts, peanuts, sugar, GMOs, preservatives and artificial colors. No refrigeration is required. Our unique prebiotic supplement is manufactured in the USA in an FDA and GMP, state-of-the-art facility. Every batch is third-party tested to ensure the ingredients are safe, pure and potent. We pride ourselves on our superior ingredients. TESTED FOR HEAVY METALS. No other brand looks at quality quite the way we do. We devote the time and personnel to verify ingredient safety, and test for purity and quality at multiple steps, all to make sure our advanced prebiotic is tested for solvent residues, heavy metals, pesticides, and toxins. The result? We created a higher level of purity, safety, and quality for a superior prebiotic product. PRODUCT SAFETY. While most companies only use 1 or 2 seals, our Advanced Prebiotic has 3 seals: an integrity and tamper proof seal to close the box, a pre-perforated neck-band and a heat-induction inner seal.